Home General How do Passive House buildings stay comfortable in summer? Passive House buildings are designed to be comfortable all year round – cozy and warm in winter (20°C), comfortably cool in summer (25°C). 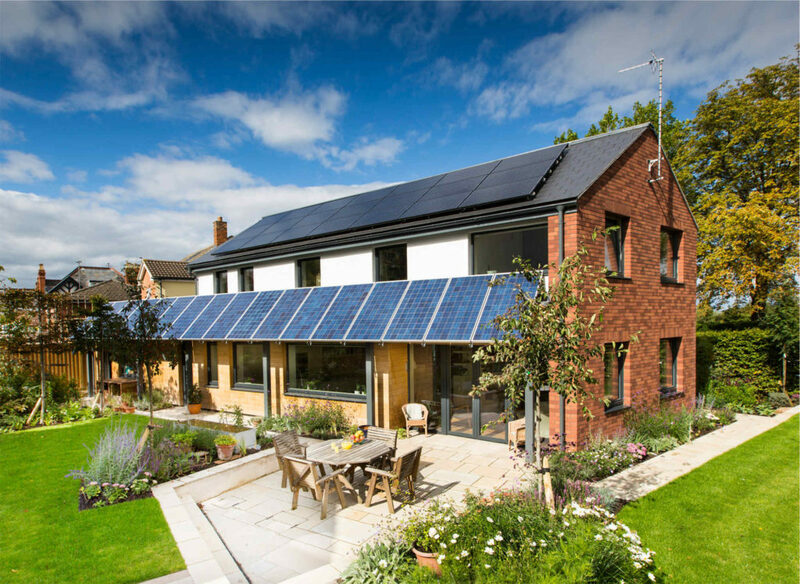 Due to their rigorous design and planning requirements, the feedback from Passive House occupants confirms that Passive Houses can be much more resilient during periods of hot weather than conventionally built buildings. The temperatures measured inside and outside the building were very close to the ones used in PHPP. Lowest temperature during winter was 20 °C and highest temperature measured in summer was 25.7 °C. It’s all about the design and keeping the heat out! Designers use the Passive House Planning Package (PHPP) to optimise the building for the local climate conditions. For high summer comfort this means understanding the solar loads and the ventilation strategy to ensure that temperatures inside the building do not exceed 25 °C for more than 10% of hours annually. In fact, it is advised that buildings are designed to achieve well below this limit. It is in the nature of well insulated Passive Houses that that they are resilient to temperature peaks, so that the highest temperatures will exceed the 25 °C threshold only by a slight margin. If the climate is too hot to be able to ensure comfortable conditions with only passive cooling means, Passive House buildings are kept cool with an efficient cooling system. Optimising the design and prioritising passive cooling strategies makes sure that the cooling load is kept very low. Here are some of the measures that help Passive House buildings stay cool and comfortable during hot summers. Although one does not always have complete control over the orientation of a building, especially in retrofit projects, it is still very important to consider which direction the building is facing and where the windows will be installed. Windows facing east or west are a particular risk, as the low altitude of the morning or afternoon sun makes shading difficult. South-facing windows (or north for those in the southern hemisphere) can be shaded during the summer by overhangs, whilst still taking advantage of most of the solar gains from the lower angle of the sun during winter. We have windows for many reasons, to provide natural light, to see outside, to let fresh air in and to benefit from solar gains during winter. During summer, however, whilst it is important to make sure there is enough natural lighting through windows, keeping solar loads low will prevent the building from heating up. In any building (Passive House or otherwise), shading plays a very important part in keeping a buildings cool. Closing fabric curtains or blinds can help but using exterior shading elements are much more effective. Even trees will help to keep out the sun. Without appropriate shading in the summer, sunlight can quickly increase indoor temperatures. Passive House buildings are often designed to make use of the angle of the sun by installing correctly designed shading elements that reduce solar gains in summer but still allow for some solar gains when the angle of the sun is lower in winter. I’ve lived in homes without air conditioning most of my life. In the summer, I have always closed the windows and pulled down the internal shades during the day. The difference between conventional construction and Passive House is comfort and not feeling lethargic due to heat. Insulation does not create any additional heat; it only reduces the heat exchange between systems with different temperatures. Therefore, it also protects a cool system from gaining heat from the surroundings. 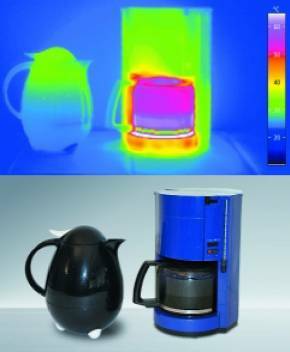 This is where the common example comparing a Passive House building to a thermos flask comes in handy – it works just as well for a cold liquid as for a warm one. Passive House buildings also need to be equipped with a Mechanical Ventilation system in order to keep a constant supply of fresh air running through the building. During the summer months, it is important that the system uses a summer bypass of the heat recovery to stop the extract air transferring any extra heat to the incoming air. Only when ambient temperatures are well above 25 °C does the use of heat recovery become useful in summer to keep that heat outside. Similarly, in humid climates, energy recovery systems are effective to keep the outside humidity from entering the building. Summer comfort also benefits well from window ventilation whenever it has cooled down outside. Whether that be night time ventilation, cross ventilation or early morning ventilation (provided the temperatures drop to a suitable level). It is also important to consider how a building is used during the summer and to be aware of indoor sources of heat from e.g. cooking, electrical devices and water heating. All these indoor heat sources add up, and when not fully considered can end up adding considerable heat to the house. It is an integral part of the Passive House concept to minimise the energy consumption of all services in the building and encourage the use of efficient equipment throughout. However, it is not always possible to predict or to influence what kind of equipment and appliances future tenants will use. When planning the building it is therefore important to understand the interplay between internal heat loads and summer comfort, which can easily be modelled and tested with the PHPP. When a Passive House certifier is commissioned to audit the quality of the planning, they closely study the summer behaviour of the building. If the criteria for summer comfort are not met, they will need to amend the plans for the building. For example, the hot water pipes may need to be better insulated so that they give off less heat to the house. In some cases, this may also mean installing an active cooling system. Due to the low heat loads, however, a small cooling unit with low power consumption is sufficient for a Passive House. This method has proven to be very effective in a range of certified Passive House projects. We are certainly satisfying any concerns of comfort with a spot source cooling unit. What’s more, if a building owner has installed an on-site photovoltaic system, they can easily supply the small additional energy needs of their cooling unit on the hot summer days when it may be required. As highlighted above, all-year round comfort is a key feature of Passive House projects. There are a range of design and planning measures that can easily be implemented into a project to ensure the building remains comfortable in summer when temperatures rise. The superior insulation and high levels of airtightness help reduce the transfer of heat from outside to inside therefore helping the building to maintain a cooler interior temperature. Shading elements and well positioned Passive House windows help to minimise extra solar loads and night time window ventilation (when temperatures/location allow) is a very effective and free cooling method. As in any building during hot weather, being aware of indoor sources of heat and using energy efficient electrical devices will also help to maintain a comfortable temperature. And in climate zones where active cooling is required, a well thought-out cooling strategy will go a long way in maintaining comfortable indoor temperatures and keeping energy bills low. If you are interested in learning more about Passive House in summer and in different climates, then visit Passipedia or browse through the further reading below. Overheating – how can we avoid it? Should you expect overheating in a Passivhaus? © International Passive House Association, 2018. Unauthorized use and/or duplication of this material without express and written permission from this site’s author and/or owner is strictly prohibited. Excerpts and links may be used, provided that full and clear credit is given to International Passive House Association with appropriate and specific direction to the original content. building overheating, comfort, comfortable, cooling, hot weather, insulation, orientation, passive house, shading, summer, ventilation, windows. Bookmark.